Hervé Poulain, a French race car driver and auctioneer, introduced the concept of The BMW Art Car Project in the early 1970’s. His idea was to invite an artist who would turn a mere car into a work of art. By 1975, the project took off and he recruited Alexander Calder, both a friend and an American artist, to be the first in line to paint the first of many BMW art cars. The first model was to be a BMW 3.0 CLS that Poulain would take to the tracks for the 1975 Le Mans endurance race. Following Andrew Calder’s three-dimensional work of art on wheels, numerous well-known artists from all over the world took part in the project, including Andy Warhol, David Hockney, Frank Stella, Jeff Koons, Jenny Holzer, Olafur Eliasson, Robert Rauschenberg, Robin Rhode, and Roy Lichtenstein. These artists have been chosen carefully by a panel of international judges. 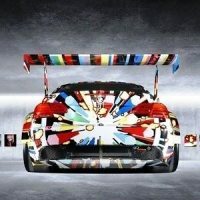 To date, between race cars and production vehicles, there are a total of seventeen BMW’s that have been turned into works of art and are officially included in the BMW Art Cars Project. Over the years, the project’s mission has evolved. It began as a creative endeavour solely for race cars, void of any public relations efforts. However, since the creation of the BMW Art Cars Project, it has developed tremendously, in which some of the vehicles are now used as a promotional mechanism of the company’s artistry, creativity, and commitment towards alternative and renewable energy sources. Influenced by his passions for engineering and sculpting, Calder’s greatest challenge was in leaving his artistic imprint on a three-dimensional mechanism that he did not engineer, nor sculpt, himself. 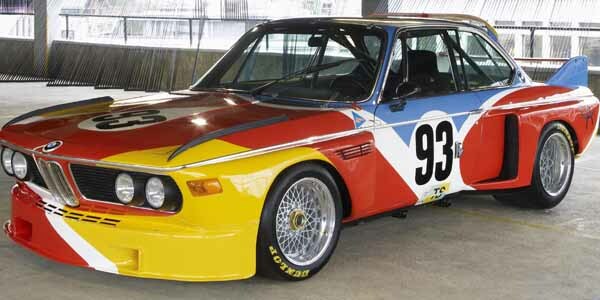 On the outside, the BMW 3.0 CSL boasts his unique style of artistic expression, with whimsical high-pigmented colours and various curves and lines. On the inside lies a powerful 6-cylinder engine that produces 480-horsepower and a top speed of 181 miles per hour. Calder was invited to attend the Le Mans endurance race of 1975, where he had the opportunity to see his art on the go.